Modex 2014 at the Georgia World Congress Center is the Material Handling Industry of America's largest and most comprehensive tradeshow in 2014. You can learn and experience everything that makes distribution centers tick, from inbound to outbound, but the most compelling story's come from real customers. 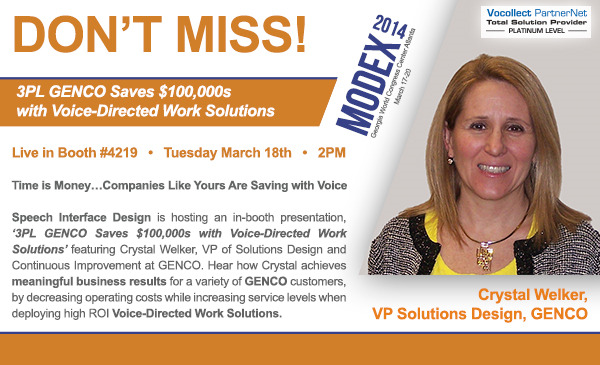 So, don't miss a chance to learn how voice picking is saving GENCO customer's $100,000s and providing meaningful business results. These top line benefits are realized by decreasing operating costs, while increasing service levels. GENCO's VP of Solutions Design and Continuous Improvement, Crystal Welker, will present on Tuesday, March 18th 2014 at 2PM in Speech Interface Design's booth #4219. Crystal will explain in detail how a variety of 3PL customers have significantly benefitted from voice picking, their unique needs and challenges and the return on investment achieved from the capital investment.